I normally shoot Raw + Jpeg. In this mode, I get a burst of three frames at 1.25 fps, then it oscillates between about .7 and 1.25 fps. If I switch to Raw only, things improve a bit; I get a burst of four frames at just over 4 fps, and then it settles down to about 1 or 1.1 fps. Storage cards are Sandisk Extreme, 45 MB/s. Am I right in thinking that Raw without Jpeg is the fastest mode for continuous drive? Are there any other adjustments I could make to increase the continuous drive rate? Canon specifies that you can shoot up to 15 JPEG or 6 RAW images or 3 JPEG+RAW files continuously at 4.3 FPS. This is under ideal conditions with focus locked on the first frame. Most importantly, this is measured with a sufficiently fast memory card. Since you are getting so many fewer shots, it is most likely that your card is too slow. You can get faster models which will improve the performance up to the specified maximum. This affects how fast the buffer is cleared but will not change the drive-speed which is pretty much set. 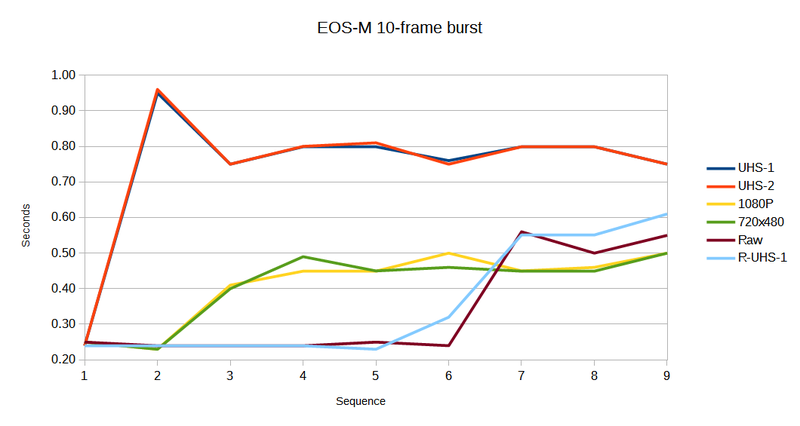 I had the same problem with burst speed with my EOS M: JPEG only was slower than RAW only. The reason was in the menu: Lens aberration corretion -> Chromatic aberration -> if "enable" is set then JPEG slow down, when change to "disable" JPEG burst mode last much longer. Shooting JPG only should be faster than RAW only. Although the camera has to process the JPG, the resulting file is much smaller and generally the memory card is the bottleneck, so smaller files transfer faster and get you a higher rate. For what it's worth, I have just conducted a small experiment to try to confirm the effect of (RAW only) x (RAW + JPEG) x (JPEG only), and the effect of SD card speed. Not the answer you're looking for? Browse other questions tagged continuous-drive canon-m or ask your own question. Is there any alternative to the Canon Mount Adapter EF-EOS M?